This is a very simple quick game for the kids. The presents drop from the top when you hit the space bar. 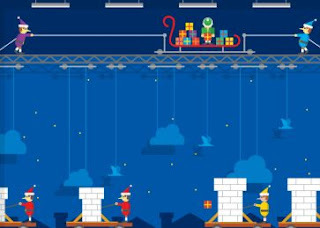 You try to aim for the boxes by moving the sleigh with the arrow buttons. The elves are packing the gifts in the boxes for Santa! This game is simple, easy to load and quick for the kids to play. Click the red & white Santa Tracker button to play 2 more games. It is located at the bottom left hand side of your screen. There are 3 games in all Present Drop, Village Racer & Jet pack. These games load very quickly and are very easy for kids to play. Don't forget your free personalized Santa Call, Text or email. Click on the phone icon with Santa's picture next to it to get to the page. Thank you Google! You rock!